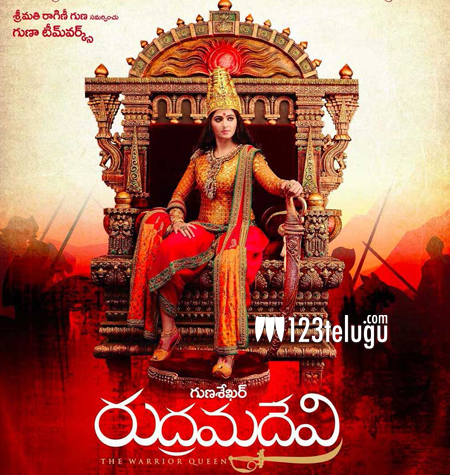 Director Gunasekhar revealed the budget of ‘Rudhramadevi’ yesterday at the audio function that was held in the city of Vizag. The director became slightly emotional while speaking at the function and he said that a lot of effort went into the making of this movie. “Anushka worked as hard as any other male actors. Allu Arjun came forward to do the role of Gona Ganna Reddy and Sirivennela Sitarama Sastry wrote special lyrics after he saw my detailed analysis and research. We spent 70 Crores on this movie”, he said. Ilayaraja has composed the music for this movie. Three more songs will be released from the movie today in Warangal.